In the weeks following the March 11th disaster the estimated exposure dose for children was abnormally elevated, leading the Japanese government to begin testing to deduce the amount of radioactive iodine concentrated in the thyroid of over 1000 children shorty after the accident. Many parents demanded the tests, drawing parallels with the 1986 Chernobyl nuclear disaster, after which locals reported thyroid disorders, a problem sometimes associated with radiation exposure. The Japanese Yomiuri report shows that the government’s Nuclear Emergency Response Headquarters did not fulfill requests from the Cabinet’s Nuclear Safety Commission of Japan (NSC) to conduct further testing on the internal radioactive exposure of children, due to fears of how the public may react to the inspections. One tragedy endured by the Soviets after the Chernobyl disaster, was an epidemic of thyroid cancer among people exposed to the radiation as children, which to a large extent was preventable and would probably not have happened if people had been told to stop drinking locally produced, and today many argue that there is no justifiable reason for it to be repeated in Japan. A report released in the beginning of April 2011 by the Nuclear Safety Commission said that monitoring the children was too difficult to carry out for a variety of reasons, and additional follow up tests were repeatedly delayed. Someof the repeated reasons by the NSC was “the difficulty of transporting a 1-ton thyroid monitor,” “requiring the child to travel long distances for tests,” “Iodine has a short half life, it’s hard to get a grasp of what’s going on unless measurements are taken early on,” and “risk of spreading extreme panic and making the child, the child’s family and their local community targets of unwarranted discrimination” as reasons. Although not above legal limits, Tokyo metropolitan government officials were forced to dispel public concern after 210 becquerels of radioactive iodine was detected per kilogram of water at the Kanamachi water purification plant in Katsushika Ward, Tokyo by March 25th. The hazardous iodine level provisionally defined under the Food Sanitation Law for drinking water in March 2011 was 300 becquerels per kilogram in general, and 100 becquerels for infants. Tokyo Electric Power Co., the operator of the Fukushima plant, said in June that it had found cesium in milk tested near another nuclear plant about 210 kilometers from the damaged station. The samples were taken on May 12. Restrictions were imposed on food shipments from Fukushima, Shizuoka, Tochigi, Gunma, Ibaraki, Chiba and Kanagawa, shortly after the announcement. Products including spinach, mushrooms, bamboo shoots, tea, milk, plums and fish have since been found to be contaminated with cesium and iodine as far as 360 kilometers from the station. Contamination was detected in 347 food samples from eight prefectures by June 9, according to the Ministry of Health, Labour and Welfare. Two chemical elements that could seriously expose children to radiation are iodine-131 and cesium-137. If iodine-131 is taken into the thyroid gland, it remains there for a long time, damaging adjacent tissues through beta decay (by which a beta particle, an electron or a positron, is emitted from an atom). In October 2011, screenings in Fukushima Prefecture began after a recent unofficial survey reported that 10 out of 130 children evacuated from Fukushima had hormonal and other irregularities in the thyroid glands. It was later determined that they could not establish a link between the irregularities and the nuclear accident. Although the government has been trying to pacify citizens by claiming there is no immediate threat to human health as a result of exposure to radiation, medical experts are deeply concerned about children and their exposure and the potential hazard to their health. Agriculture Minister Michihiko Kano has been quoted as saying officials didn’t foresee that farmers might ship contaminated hay to cattle ranchers. That highlights the government’s inability to think ahead and to act, said Mariko Sano, secretary general for Shufuren, a housewives organization in Tokyo. In July, Japan’s biggest supermarket chain, said 1,614 kilograms (3,558 pounds) of beef from cattle fed contaminated feed had been unknowingly sold at stores in Tokyo and nine other prefectures. The government rushed to ban cattle shipments from Fukushima, although not before suffering another embarrassing case where the response was only initiated after finding contamination in publicly distributed products. The Japan Times reported that checks by the Minami-Soma Municipal Mospital using Whole Body Counters (WBCs) show of 527 children checked in and after September, 268, or 51 percent, were found to have suffered from internal exposure to cesium-137. One doctor at the hospital said some of the children had been eating wild plants picked in the mountains. Evidence of high-level exposure to gamma rays was detected in the clothes of some children, indicating, he said, that their parents were paying little attention to the risks of radiation exposure. Although the likelihood of cesium-137 causing cancer is contested by some scientists, the fact is that little scientific research has been done on the matter. Medical doctors working in the contaminated area have said the Japanese government have been moving much too slowly to cope with the situation, and comparing it to that of the government of the former Soviet Union in its dealing with the Chernobyl disaster. Haruki Madarame the chief of the Nuclear Safety Comission admitted Japanese safety requirements such as for tsunami and power losses were too loose and many officials have looked the other way and tried to avoid changes. Japanese authorities announced they will prioritize decontamination of areas where children’s external radiation exposure is estimated to be 2 millisieverts or more per year. Many Japanese schools have removed topsoil on the playgrounds to reduce the dose, and the Education Ministry provided radiation handbooks for teachers. A recent survey in Soma City, which lies on a stretch of Pacific coast between 30 and 50 kilometers from the crippled Fukushima No. 1 nuclear plant, showed some 50 percent of elementary school children and approximately 70 percent of junior high school students registered 2 millisieverts or more at schools in mountainous areas where the airborne radiation doses were only registered at 1 microsievert per hour. Even at schools where the airborne radiation doses were relatively low at 0.2 to 0.4 microsieverts per hour, several children were found to have been exposed to 2 millisieverts or more of radiation. The results indicate that the exposure levels vary depending on areas as well as individuals. “It’s important to detect how much radiation children were exposed to and respond appropriately,” said Soma Mayor Hidekiyo Tachiya. “Based on the measured values, we will set priorities in carrying out effective decontamination work.” Many children are allowed to play outside only two or three hours a day. 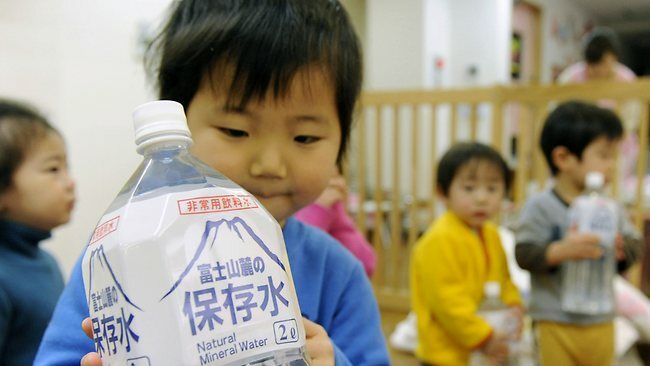 Thousands of children have been moved out of Fukushima since the March disasters, mainly due to radiation fears. Some residents are skeptical about the survey’s objectivity because of mistrust toward the government, which repeatedly delayed disclosing key data and which revised evacuation zones and safety standards after the accident. It must be admitted, even if the Fukushima disaster were to lead many people developing cancer, we may never find out. The ordinary rate of cancer is so high, nearly 40 percent, and our understanding of the effects of radiation exposure so limited, that any increase in cases from the Fukushima nuclear plant disaster may be undetectable. A health survey should be a start, not a goal, and should also be focused on checking for as many potential indicators as possible. Proposing a study “to relieve radiation fears” is an inappropriate foundation for pure medical research, as it may lead to a lack of thorough investigation and reliability in the results.. The threat of Thyroid uptake leading to cancer is one of a laundry list of potential effects, which ranges from diabetes and heart problems to cataracts.